"Avoid the pain of Windows 8. 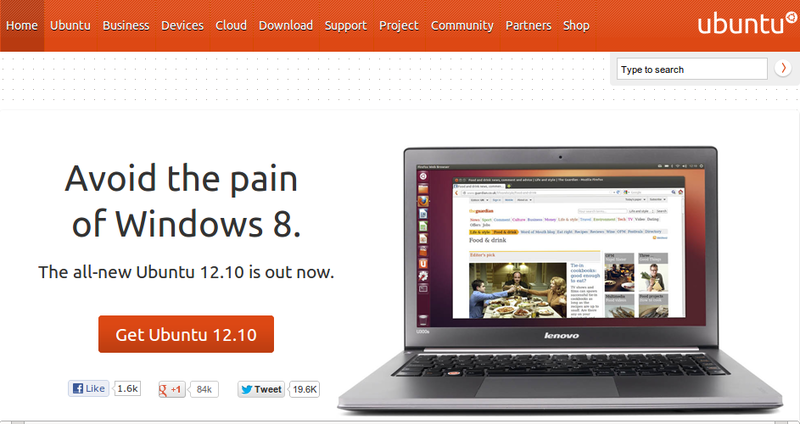 All new Ubuntu 12.10 is out now," reads Canonical's official banner announcing the arrival of Ubuntu's latest iteration, Ubuntu 12.10 Quantal Quetzal. Pretty strong language, I must say. It is a normal practice in the corporate world to NOT name their biggest competitors in an official announcement like this. I think Canonical have made up their mind to break all conventions and go all out against the Redmond Giant. If you are an Ubuntu 12.04 LTS user, upgrade option must be already available in your Update Manager. But if you want stability instead of new features. I will recommend you to stick with Ubuntu 12.04 LTS for the time being. After all, it is a long-term release and you don't have to worry about software updates for the next 4-5 years at least. Now go ahead and download Ubuntu. While you are at it, make a contribution to Ubuntu, however small it is (there is now an option to donate right after you click the download button).